"Sherwood, Nottinghamshire" redirects here. For other uses, see Sherwood (disambiguation). 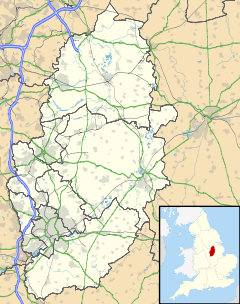 Sherwood (/ˈʃɜːr.wʊd/) is a large district and ward of the city of Nottingham, in the English ceremonial county of Nottinghamshire. It is situated approximately 1.5 miles (2.4 km) north of Nottingham city centre. The population of the ward taken at the 2011 census was 15,414. It is bordered by Woodthorpe to the northeast, Mapperley to the east, Carrington to the south, Forest Fields, New Basford and Basford to the west, and Daybrook and Bestwood to the north. Several carved, dated stones in buildings indicate development in the area between 1870 and 1910, during the growth of the lace industry. There are also several listed buildings. Sherwood Bus Depot was built in 1900 by Nottingham Corporation Tramways, as part of an initiative to extend the Carrington line to Winchester Street. Trams ran on the route until 6 September 1936 when they were replaced by buses. Part of the premises is now occupied by the Samuel Hall public house, part of the J D Wetherspoon chain, and another part as community meeting rooms known as 'The Place Activity Centre', run by the Sherwood Depot Action Group. The ward of Sherwood (which includes some adjacent neighbourhoods) is represented by Nottingham City Council and has three Labour Party councillors. It lies in the Nottingham East parliamentary constituency, which from 1992 until 2010 was represented by MP John Heppell, and from 2010 by Chris Leslie, who was elected with a majority of 6,969. Within the area of Sherwood, there are two primary schools: Seely Primary and Nursery School on Perry Road, and Haydn Primary School on Haydn Road. Haydn Road is also the location of Nottingham Free School, which is in Berridge Ward in the neighbourhood of New Basford. Nottingham Prison and Young Offenders' Institute is located on Perry Road. In October 2007, Sherwood Police Station opened at 621 Mansfield Road, allowing for a more visible local police presence. As a result, crime fell by 13% from 2008 to 2009. The station was one of twelve sites closed three years later as part of a cost-saving drive. Only a police contact centre next to the library remains. The main shopping precinct lies along the busy A60 Mansfield Road. High street shops such as Boots, LloydsPharmacy, Wilko and Co-op Food are interspersed with charity shops, including Oxfam and Cancer Research UK and several restaurants. Other amenities include a sub-post office, newsagents, butchers, stationers, dentists, garages, greengrocers, hairdressers, cafés, estate agencies, the Nottingham Building Society and several pubs. The Jason Spencer Sports Ground[permanent dead link] was built in 2011 on Valley Road after the murder of local teenager, Jason Spencer. It has a basketball court, an outdoor gym and a skate park. Sherwood Community Centre lies at the northern end of Mansfield Road, opposite the Woodthorpe Grange Park. It is the meeting place of many well established local groups such as the Bobbin Lace Society, the Sherwood Playgroup and the Prince's Trust. It also hosts a wide variety of activities, including adult ballet and tap classes, yoga, creative embroidery and Zumba. Sherwood Library, on the corner of Mansfield Road and Spondon Street, holds regular community events. Sherwood has a number of churches, including St Martin's Church on Trevose Gardens, Sherwood Methodist Church on Devon Drive, and United Reformed Church on Edwards Lane. Sherwood has a thriving arts scene and each year hosts Sherwood Art Week. Each year a series of exhibitions, craft fairs and workshops takes place, bringing the artistic community together. Sherwood is served by several Nottingham City Transport bus routes and is on the A60 road, an arterial thoroughfare into Nottingham city centre. L8: Mapperley – Woodthorpe Court – Sherwood. ^ "Sherwood Ward & Surgery Details". Nottingham City Council. 28 January 2009. Archived from the original on 25 November 2010. Retrieved 21 August 2010. ^ "Election 2010". BBC News. Retrieved 21 August 2010. ^ "Seely Primary and Nursery School". Retrieved 2 June 2015. ^ "Haydn Primary School". Retrieved 21 August 2010. ^ HM Prison and Probation Service (16 May 2018). "Nottingham Prison information". justice.gov.uk. Ministry of Justice. Archived from the original on 16 May 2018. Retrieved 16 May 2018. This page was last edited on 8 March 2019, at 19:57 (UTC).